Northamptonshire metallers Krysthla will release their debut album ‘A War Of Souls And Desires’ on 25th September via PHD. 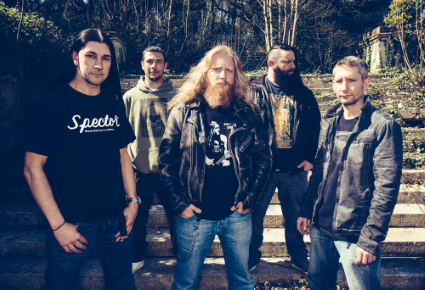 Not only have the band have broken into Amazon’s Top 20 metal pre-order chart (alongside new releases by Iron Maiden, Disturbed, Saxon, Deep Purple) with their forthcoming debut album, they have just premiered their debut lyric video ‘Luminosity’. Featuring former members of UK metal heavyweights Gutworm and Deadeye – Krysthla’s crushing debut album will resonate with fans who like their metal on the dark side but layered with sonic soundscapes that explore musical boundaries and pushes the envelope as to what British metal is. The songs themselves focus on world and political events and the ancient rites attached to them that we as a people in a modern age partake in willingly. With such a deep and expansive subject matter the music had to manifest this in a physical form which naturally led us to the hellish blend of unrelenting heaviness but with texture, colour and groove. Krysthla have signed European and worldwide distribution deals with Plastic Head (PHD) which will see the album stocked in record stores across the UK as well being available via digital distributers including iTunes, Amazon and Spotify worldwide. Krysthla’s three track sampler EP ‘A Thousand Points Of Light’ was released in 2013 and after two years writing new material, the band’s evolution has been realised with this astonishing debut album which takes extreme metal to new heights and is truly British.